JIM JARMUSCH (Writer/Director), one of the leading American filmakers of his generation, was born in Akron, Ohio. His feature film career began with PERMANENT VACATION (1980), which won the Joseph von Sternberg Prize (Mannheim) and the International Critics Prize (Figueira da Foz, Portugal, 1982) This was followed by STRANGER THAN PARADISE (1984), a landmark film which received the Camera d'Or at the Cannes Film Festival and was voted Best Picture of the Year in the United States by the National Society of Film Critics in 1984; it was also named Best Foreign Film in Japan in 1985. Jarmusch's next film, DOWN BY LAW (1986), won prizes for Best Foreign Film in Norway, Denmark and Israel; the film's star, Roberto Benigni, was named Best Actor in Denmark and Italy. MYSTERY TRAIN (1989) was awarded the Prize of Highest Artistic Acheivement at Cannes. NIGHT ON EARTH (1991) won the Grand Award for Best Feature Film at the Houston International Film Festival (1992) and the Independent Spirit Award for Best Cinematography (1993). 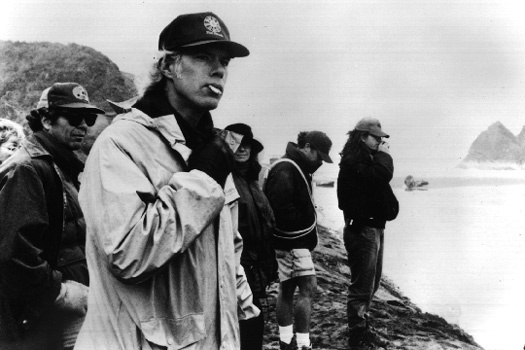 Jarmusch is also directing a continuing series of short films all entitled COFFEE AND CIGARETTES: the first, simply COFFEE AND CIGARETTES (1986), stars Steven Wright and Roberto Benigni; the second, subtitled MEMPHIS VERSION (1993), stars Steve Buscemi, Cinque Lee and Joie Lee; the third, SOMEWHERE IN CALIFORNIA (1993), is with Iggy Pop and Tom Waits. It received a Golden Palm at the 1993 Cannes Film Festival. DEAD MAN received its world premiere at Cannes in 1995. QUESTIONS ANSWERED BY JIM JARMUSCH, ABOUT "DEAD MAN." Why did you decide to make a film concerning death? Why William Blake, the poet? Which tribe does Nobody come from, and what language does he speak? Was Neil Young's music in your mind even during the shooting of the film? DEAD MAN was conceived as a black-and-white film from the very beginning. There are several reasons for this decision. The primary one is that the story is about a man who takes a journey which carries him further away from anything familiar. Color, particularly in landscapes, connects us with things due to our familiarity with their tonal values, and this would have undermined a basic element of the story. Also because DEAD MAN is set in the 19th century, the absence of too much information (that provided by color) is a way of gaining some historical distance, again neutralizing a certain familiarity with specific objects and locations. Another reason for black-and-white is that since the late 1950’s and early 60’s stories using the "western" genre seem to be filmed in the same dusty color palette over and over again. Whether in a film by Leone or Eastwood, or even a TV episode of BONANZA, the colors always seem the same to me. If these color values operate on a sub-or semi-conscious level for the audience, I would prefer that the black-and-white of DEAD MAN recalls the atmosphere of American films from the 40's and early 50's, or even the historical films of Kurosawa or Mizoguchi, than the overly familiar palette of more recent "westerns". Last but not the least, I wanted to work again in black-and-white with Robby Muller. Robby, as always, did amazing work photographing DEAD MAN, and working with the negative to include all possible gray tones while keeping the black and whites very strong, almost as though color film hadn't been invented yet. The "western" as a genre is very open to metaphor, and has deep roots in classical narrative forms. "Westerns" are most often stories involving journeys into unfamiliar territory, and they are also often shaped around very traditional themes, like retribution, redemption, or tragedy. The openness of the form, and its inseparable connection to "America" in the broadest sense, attracted me to it. I have to admit, though, that DEAD MAN is not a traditional "western" - the genre was really only used as a point of departure. Death is life's only certainty, and at the same time its greatest mystery. For Bill Blake, the journey of DEAD MAN represents life. For Nobody, the journey is a continuing ceremony whose purpose is to deliver Blake back to the spirit-level of the world. To him, Blake's spirit has been misplaced and somehow returned to the physical realm. Nobody's non-western perspective that life is an unending cycle is essential to the story of DEAD MAN. William Blake was an English visionary poet, painter, printer and inventor. His work was revolutionary, and he was imprisoned for his ideas. I can't honestly site a specific, concrete reason why he entered my script, except that while I was reading books by Native Americans on Native American thought, it struck me that many of Blake's ideas and writings sounded as though they could have come from the soul of a Native American. This is particularly true of Blake's PROVERBS FROM HELL which, along with other fragments of his poetry, are quoted by the character Nobody throughout the film. The character of Nobody is of mixed blood - he is half Blood and half Blackfoot. These tribe s are considered "Plains Indians," from the great plains of the northern and central parts of the western half of North America. Nobody, however, is an unusual character - he is also a linguist who, in the course of the story, speaks Blackfoot, Cree, Makah and English. I've been a fan of Neil Young for many years, and I was listening constantly to Neil and Crazy Horse while writing the script for DEAD MAN. During the shooting of the film (and all the traveling it involved), we were also listening to Neil's music. Crazy horse even performed in Sedona, Arizona during our shooting period, and a large number of our crew attended the concert. From the very start of the project there were hopes of Neil Young performing music for the film, but I was never very confident that this would actually happen. When Neil finally saw an early cut of DEAD MAN and then agreed to score the film, I was ecstatic. (I should attribute this also to the fact that Jay Rabinowitz, the editor, had cut some sequences of the film to instrumental sections of Neil's existing songs as examples of how his music might work with the story). Neil eventually played pump organ, detuned piano, and acoustic guitar, but the largest percentage of the music is from his electric guitar. |What he brought to the film lifts it to another level, intertwining the soul of the story with Neil's musically emotional reaction to it - the guy reached down to some deep place inside him to create such strong music for our film. Copyright (C)1996 Miramax Films. All Rights Reserved. This site brought to you through the courtesy of New York Trash magazine.